NAIA Fundraiser hosted by Wings Plus at Ramblewood Square in Coral Springs. Tell your friends, bring your family, and get refreshed for the upcoming week. 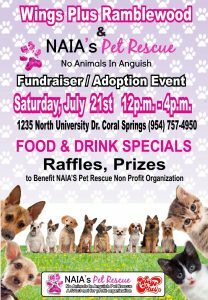 We’ll have dogs for adoption (maybe a few kitties too), great raffles from local and national vendors, DJ, yummy food (voted best wings in SoFla) specialty drinks, and lots of fun to help support our fabulous furry friends! Get a head start and purchase some of your raffle tickets now so that they’re waiting for you at the door. Hosted by the generous adopters of Corey (now Tank).